Don’t you just love pancakes? I do. However, all the pouring and flipping just takes forever. 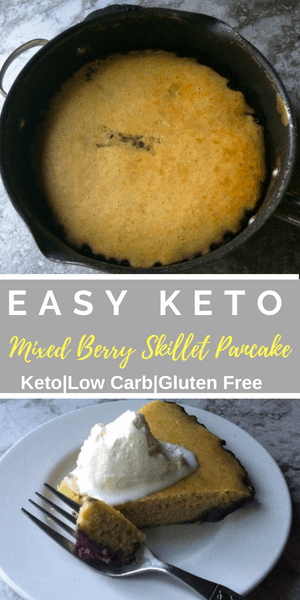 I have made a keto skillet pancake that is so super easy that you could even have this for a weekday dinner. What? Pancakes for dinner?! It only takes a couple minutes to prepare and 15 minutes to bake and dinner is done. I love easy no fuss dinner, especially ones as tasty as this skillet pancake. My husband used to make German pancakes for dinner (or Sunday brunch) before we started keto. I wanted to create something similar to that, but in keto form. This is not exactly German pancakes, but it is close and delicious just the same. In the German pancakes that my husband would make he would put sliced apples in it. To make it more keto friendly I have added mixed berries instead and topped it with whipped cream (we used to do that anyway before) or you could dust it with powdered erythritol. 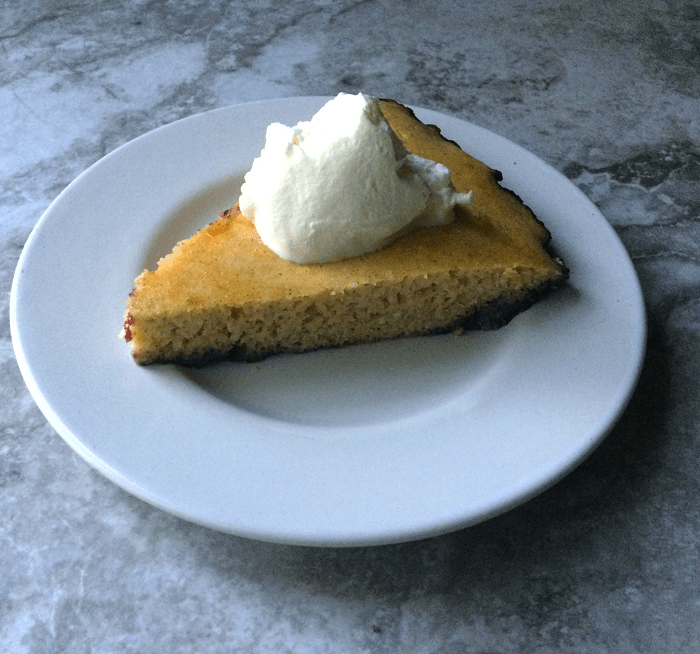 I have made this a couple of different ways and I like it best the way I have it in the recipe. However, you could top it with the fruit after it cooks or mix the fruit into the batter and then bake it. Whatever way you want to make it I am sure it will be yummy. This makes 4 big pancake wedges or 8 smaller ones. It is super filling and satisfying. I make this for my husband, myself, and my two kids (one adult man and one older teenage boy). This could also be made without fruit and flavored with extracts or emulsions. I also made this with banana emulsion and walnuts and it was really good. You could also do blueberries or sugar-free chocolate chips, just like you would for regular pancakes. The pancake is a base that you could add different flavors to. 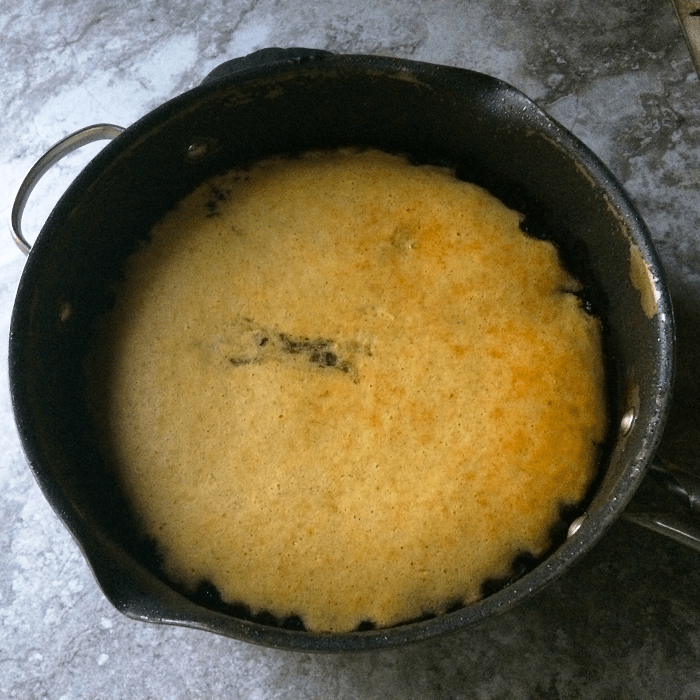 Put butter in a pan and let the butter melt, coating the bottom. Make sure it is a deep pan that can go into the oven. If you don't have one you could transfer the fruit over to a casserole dish before adding in the pancake mixture. Add fruit and cook until soft. in a medium bowl mix together heavy cream, greek yogurt, and eggs until well incorporated. In a separate bowl, mix together all the dry ingredients until combined. Add dry ingredients to the wet ingredients and mix well with a wooden spoon. When the fruit is cooked and softened, mash down any big strawberries so the fruit is more uniform in size. Pour the pancake mixture over the fruit in the same pan you cooked the fruit in or transfer the fruit to a casserole dish and then pour the pancake mixture over fruit. Bake for 13-15 minutes or until toothpick comes out clean in the center and it is golden brown on top. 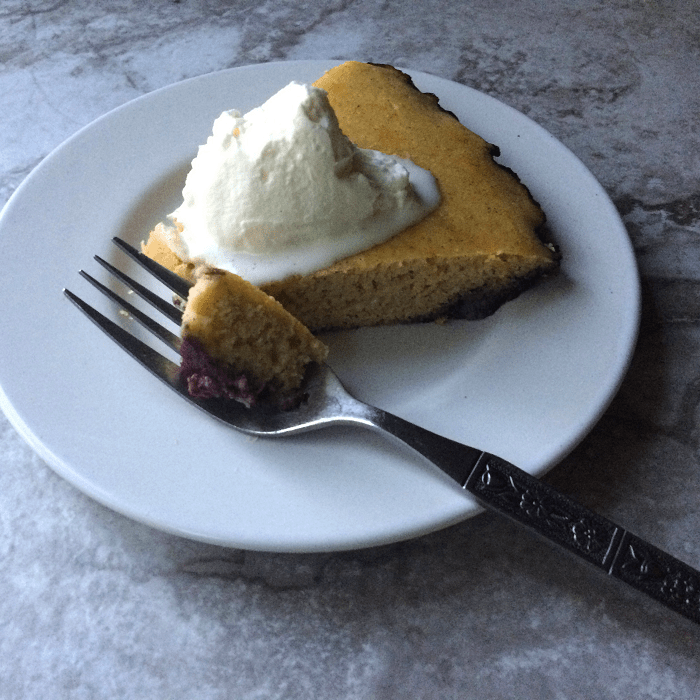 Cut and serve with whipped cream or powdered erythritol (optional).